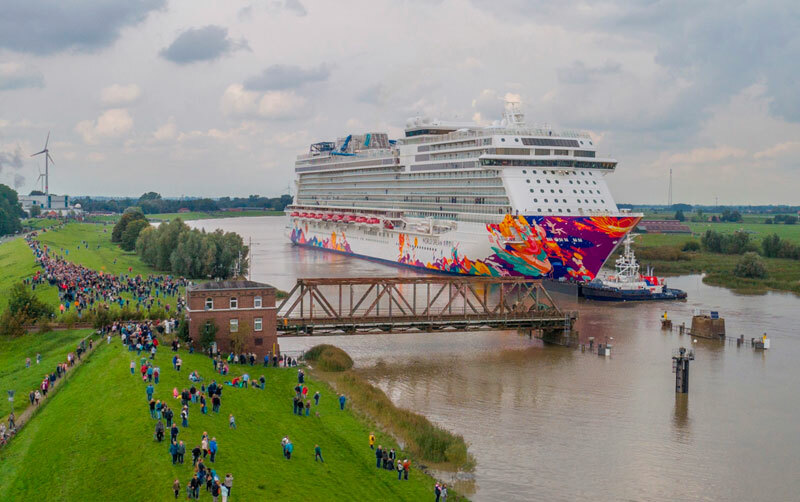 World Dream has departed the shipyard and completed its conveyance along the Ems river in Germany. World Dream is the newest cruise ship for Asian based Dream Cruises. The large vessel has departed the Meyer Werft shipyard in Papenburg, Germany. The new ship began its conveyance along the Ems river on Sunday, September 17. World Dream which has been purpose-built for the Asian market and is at Eemshaven, Netherlands to undergo initial testing and then further to Bremerhaven, Germany for additional sea trials. The ship will be delivered from the Meyer Werft to Dream Cruises on October 26. The ship will begin her epic ocean voyage that will take her from Germany to Gibraltar, through the Mediterranean Sea and the Suez Canal, across the Indian Ocean with visits to Sri Lanka and Singapore before ending at her new dual homeports in Hong Kong on 17 November and Guangzhou, China 19 November. World Dream is the sister ship the Genting Dream which entered service in 2016. World Dream is 151,100 gross tons and spans 18 decks. there is a passenger capacity of over 3,400 and the ship will be among the most luxurious in the region.